My nephew will be 21 next week so I wanted to make a birthday card for him. This another EASY card. Since my Cricut machine is always set up, cutting images is even easier than stamping. This card uses the balloon from the Artiste Cartridge. It is Accent 3 on page 70 of the booklet. The Artiste cartridge (Z3170) is fabulous and soon to be retired so order it now if you don't already own one. 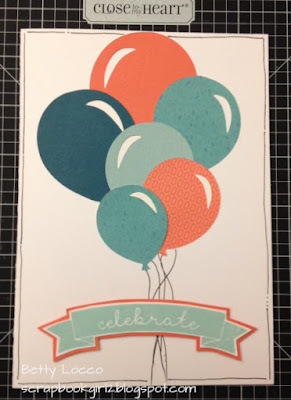 I cut a bunch of balloons from 1 1/4" to 2 1/2" (not sure which sizes I actually used- the card is 5 x 7) in Lagoon, Peacock, Glacier and Sorbet Cardstocks. I also used the Lagoon Background and Texture paper from the Calypso and Hopscotch (retired) Paper Packet. The banner is from D1672 the Kaleidoscope Cardmaking Workshop stamped in Glacier Ink and fussy cut and layered over Sorbet Cardstock. The inside has a 21 cut with the Artiste cartridge - sorry I did not take a photo of the inside. It was cute and quick card and I still have plenty of balloons to make additional cards.